We have our first look at the geek theme and franchises for the Loot Crate October 2017 mystery geek crate, including a sneak peek at one of the geek collectibles in the box! 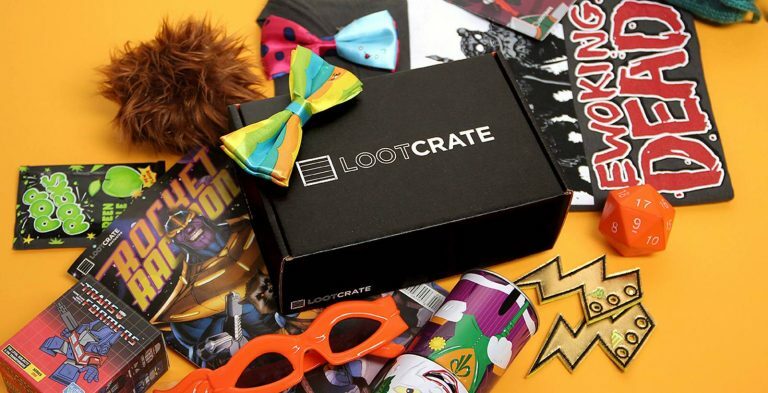 Every month, Loot Crate delivers a themed geek box featuring 4+ geek collectibles, worth $45+. 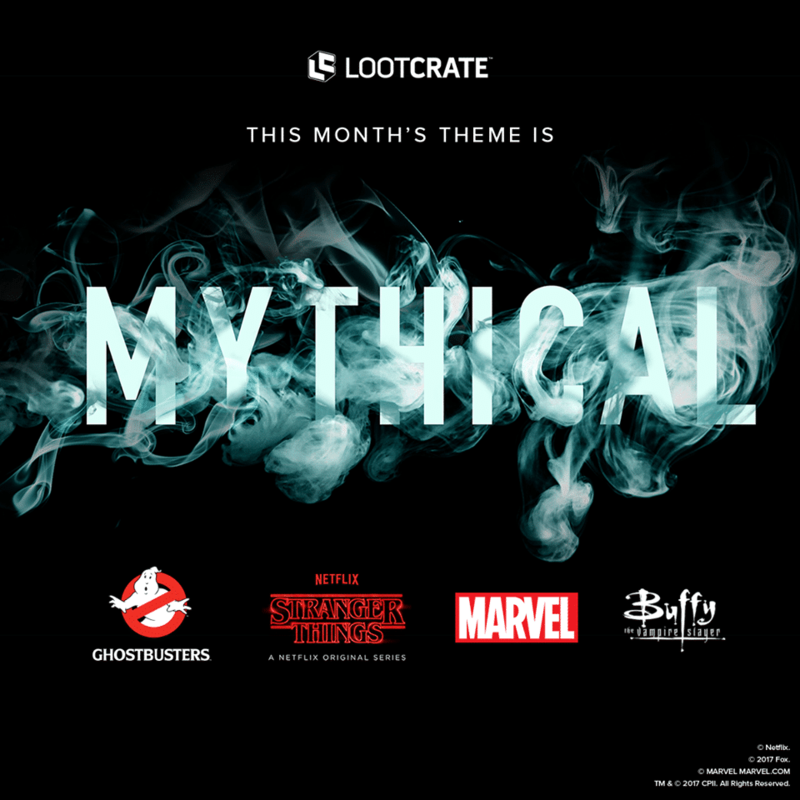 The October 2017 Loot Crate theme is MYTHICAL! You hear the stories, the whispers, of creatures and beings beyond imagination. Peer into the shadows and explore the legends in October’s truly MYTHICAL collection! Loot Crate has also provided a sneak peek at the geek franchises in the October 2017 Loot Crate Mythical crate! The Mythical Loot Crate features an EXCLUSIVE Stranger Things figure! The October Loot Crate also has exclusive collectibles from Marvel, Ghostbusters, and Buffy The Vampire Slayer. 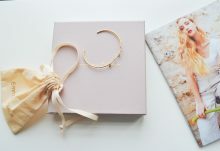 TWO figures are in the box! You hear the stories, the whispers, of creatures and beings beyond imagination. 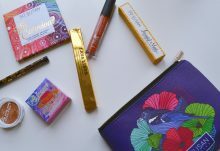 Join us as we peer into the shadows and look into other realms for October’s truly #MYTHICAL collection! Get unreal items from Marvel, Ghostbusters, Stranger Things and Buffy The Vampire Slayer that includes not one but TWO figures in addition to our monthly tee and pin! 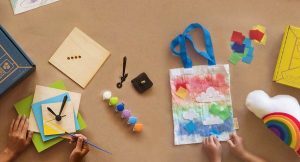 What do you think about the Loot Crate October 2017 Mythical theme and spoilers? October 2017 Loot Crate subscriptions close 9 PM PST, October 19, 2017. Subscribe to Loot Crate today to reserve your mystery geek box! 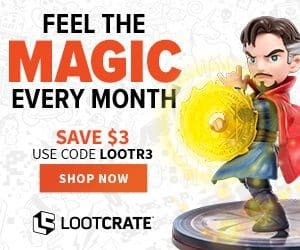 Save $3 off October’s Loot Crate when you use coupon code LOOTR3 use code SAVE10 to save 10% off any subscription. Sign-up for 12 months of Loot Crate geek boxes and you’ll get a free Loot Crate t-shirt!